4-CD box (LP-size) with 24-page book, 111 tracks. Playing time approx. 281 mns. We turn the spotlight on one of the great country songwriters of our time. 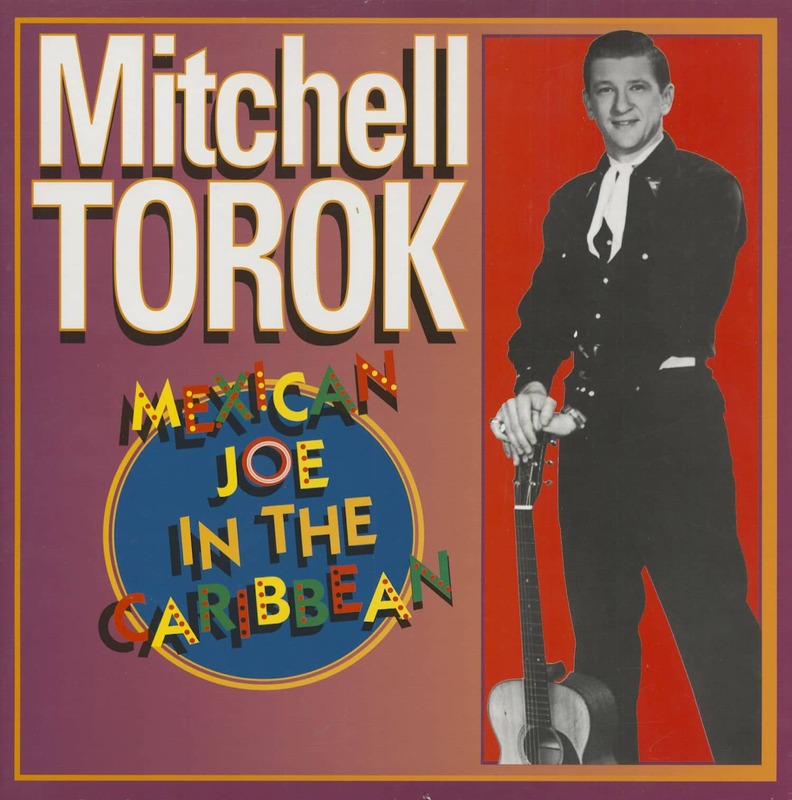 Mitchell Torok wrote ‘Mexican Joe’ for Jim Reeves, Norwood and Arkansas for Glen Campbell, Open The Door And Let The Good Times In for Dean Martin, and Redneck for Vernon Oxford. He was also a recording artist, and scored country and pop hits with ‘Caribbean’ (a number 1 country hit--and then a Top 20 pop hit five years later) and When Mexico Gave Up The Rhumba, (a Top 10 hit in England). This 4-CD set includes Mitchell's rare early recordings for FBC and Royalty, as well as his recordings for Abbott, Decca, Guyden, Mercury, and Capitol, encompassing his career from 1949 to 1963. Standout cuts include Nacogdoches County Line, Piney Woods Boogie, Sober Up, Red Light - Green Light, You Drive Buddy, Havanna Huddle, and the original version of the Top 10 pop hit Pledge Of Love. 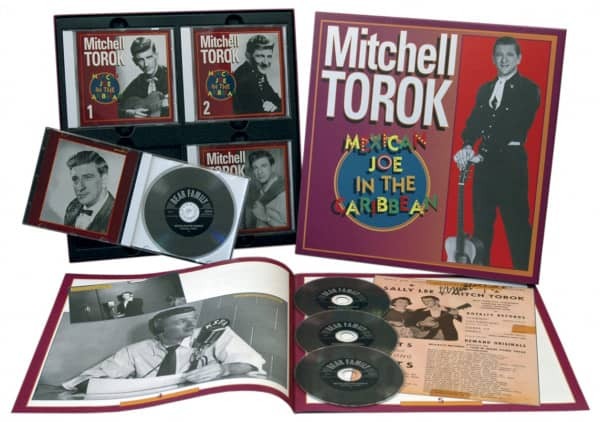 Mitchell was a different sort of country singer, and this is a great, offbeat collection. Some songwriters work purely from inspiration; they can no more write a song to order than they can find a word to rhyme with 'orange.' Other songwriters are pure craftsmen. If you want a song any time about any subject, they can dash it off. 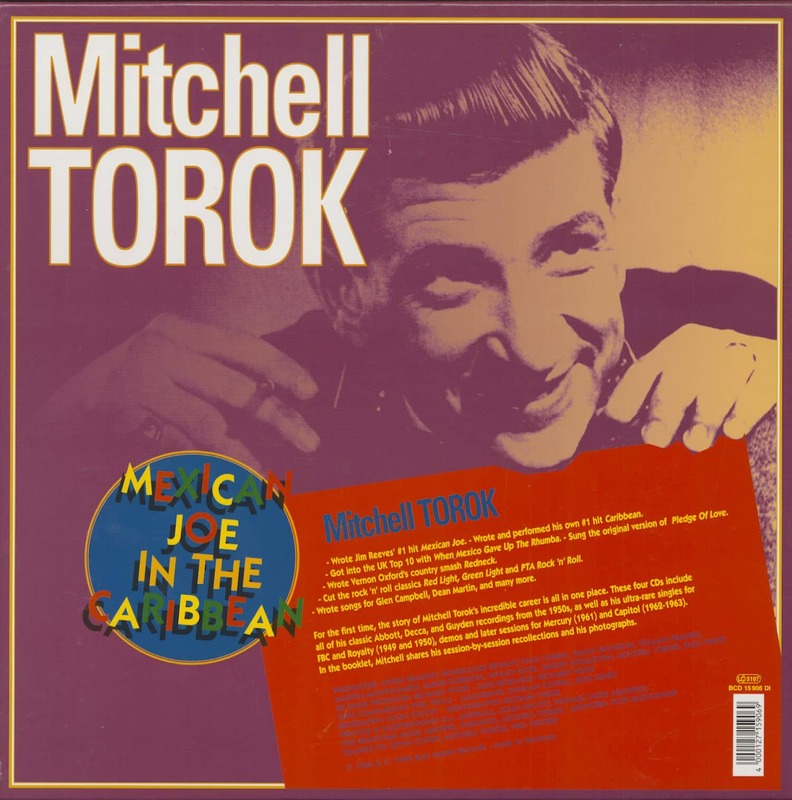 Mitchell Torok falls into the latter category. For fifteen years, he was in and out of the charts as a songwriter and performer. 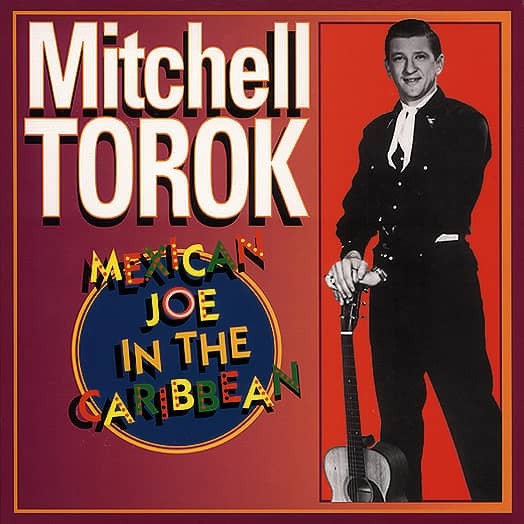 To get a sense of his diversity, consider that he had three Top 10 hits: his song, Mexican Joe, got to #1 on the country charts for Jim Reeves; his own recording of Caribbean also got to #1 on the country charts, and then got into the pop Top 30 six years later; and his record of When Mexico Gave Up The Rumba got up to #6 in England. Add to that, his salute to bubbadom, Redneck, which became a Top 20 hit for Vernon Oxford; three songs for Glen Campbell's movie, 'Norwood;' and an album track or two for Dean Martin. He also cut the original version of Pledge Of Love, his wife's touchingly innocent rock 'n' roll ballad that became a Top 20 pop hit for Ken Copeland. Mitchell has chased his dreams back and forth across the United States, and once to Europe. He has lived in Texas, Missouri, Nashville, and Los Angeles. These days, Nashville is his home, and artwork is his business. If you want a sign or a painting, he will produce one to order, much like he wrote songs to order thirty years ago. He's vigorous and prolific, and he can paint anything from an icon to a mural. Like many of those who broke into the business several decades ago, he's a little contemptuous of today's stars and today's business, and perhaps a little jealous of the huge rewards that country music delivers today. Thirty years hindsight has given him a deeper understanding of where he took wrong turns, and he'd dearly love to have back some of the opportunities that once were his. All she had was a few bags tied with rope. When I was four, I was playing under the table, and she went out to get the mail. When she came back she was crying, and I asked what was wrong, and she said in Hungarian that her mother had died. She and my father never went back. She lived to be 95; he lived to be 86. They only spoke Hungarian around the house." After leaving Indiana, the Toroks went to Wisconsin. Mitchell's older brother, Bill, was born there. Nick Torok wanted to be a postmaster, but Irene caught pneumonia twice, and her doctor told Nick that they needed to move somewhere warmer, so they packed and went to Florida. "We had seven acres in Orlando, and this monstrous hurricane came and blew everything away," said Mitchell. "They packed up again and moved away. We were broke, so we just left everything. I wonder to this day if that seven acres isn't sitting under Disneyworld. It's still ours, I guess." From Orlando, the Toroks went to Houston. Mitchell was born there on October 28, 1929. He was named for Dr. Mitchell, the doctor who delivered him. He got a guitar when he was twelve, but in high school it looked as though he would excel in sports rather than music. Unlike most country singers from that era, he didn't grow up with country music around the house. There were no big family gatherings when grandmaw and granpaw would break out the fiddle and banjo. Perhaps that's why his music was always a little bit different. He is a voluble source for his career, almost unnervingly accurate in his recollections, and that's just as well because very little has been written about him through the years. We pick up the story in 1949. Mitchell was almost twenty, and a local radio personality around Houston. When Mitchell started recording, it was for FBC Records, a lilliputian label named for Fort Bend County, just southwest of Houston. The owners, two Schulze brothers, also owned a hardware store that sold records and a radio station, KFRD, in Rosenberg, Texas. Mitchell and two friends had a show on KFRD every Saturday. "Mr Schulze owned the station," said Mitchell. "He called, and said, 'Hey, you sound pretty good. Do you want to cut a record?' I said, 'Yes sir.'" Nacogdoches County Line' was a very creditable debut, and when Mitchell went to Stephen F. Austin State College in Nacogdoches, Texas in the fall of 1949 he found that it had sold well there. One of Mitchell's contemporaries at Stephen F. Foster was Arlie Duff, who was on a basketball scholarship. "I thought the sun rose and set with Eddy Arnold," said Mitchell, "and Eddy had just the bass, Little Roy Wiggins, and himself, and that's what we were aiming for. Me and the steel guitarist, Jimmy Wayne, went to see an Eddy Arnold show once. Eddy set up backstage during half-time, and Jimmy snuck back behind the curtain and dragged his thumb across Little Roy's steel guitar to get the tuning, and Little Roy caught him and chased him outta there." In 1950, Mitchell went to Wharton County Junior College, sixty miles south of Houston, on a football scholarship. A promoter in Houston, Jimmy Franklin, signed him to a five-year contract, and landed a deal with Royalty Records (a deeply ironic name for a record company). Royalty, based in Paris, Texas, was owned by Jimmy Mercer, who claimed to be Johnny Mercer's brother. Franklin arranged the session and found the songs. Mitchell simply turned up with Jimmy Wayne, and found the rest of the group and Sally Lee, his duet partner for the day. "I have no idea who Sally Lee was," he says. "I know I was trying to sing too low, and I never will forget the drummer. He was playing a cardboard box with brushes." Mercer apparently got busted bringing 'party' records across the border from Mexico soon after Mitchell's second Royalty single was issued. Mitchell might have thought he'd heard the last from the deal, but, the music business being what it is, Jimmy Franklin reappeared three years later. Mitchell had just started scoring hits, and Franklin was brandishing his contract. "I went home to see my parents after 'Mexican Joe' hit," said Mitchell, "and he found me and served me with some papers. He sued me for fifty thousand dollars, and settled out of court for five hundred." 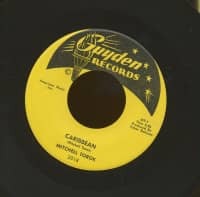 In 1954, just as Caribbean was coming on strong, Franklin leased two Royalty titles to Imperial Records. The next player to enter Mitchell Torok's life was Fabor Robison. One of the music business's great hyperbolic figures, Robison had emigrated to California from his home in Beebe, Arkansas. In between, he had been a cook in the Army during the War. After he arrived in California, he worked as a cook and a prop setter at MGM Pictures. Around 1950, he set himself up as an agent, and his first client was the rube comedian and country singer 'Carrot Top' Anderson. Late in 1950, Robison discovered Johnny Horton at a talent show. He placed Anderson and then Horton with Cormac Records, and, after Cormac folded, he started Abbott Records with the initial purpose of recording Horton. Partial funding came from a man named Abbott, who owned a drugstore. At roughly the same time, Fabor signed on with American Music as a song scout. Sylvester Cross, owner of American Music, gave Fabor $125 a month and a new Buick every year. Fabor was supposed to scour the country for songs, and place them with American Music. After Johnny Horton joined the Louisiana Hayride in 1952, Robison began spending more time in Shreveport. He took an apartment there, and toured the tri-state area promoting Horton and looking for songs. One of the artists he found was Jim Reeves. We would probably have heard from Reeves sooner or later, but the fact remains that he got his all-important big break with Mitchell's song, Mexican Joe. Politically insensitive these days, it was just the kind of breezy two-chord novelty that Reeves needed to get noticed. "I wrote 'Mexican Joe' in January 1953," said Mitchell. "It took me thirty minutes. It only had two chords, and I think I was basing it on 'Polly Wolly Doodle.' I was in Nacogdoches in my last semester of college. For two weeks I went up and down the highway to radio stations trying to give an engineer half of the song if they would cut me a demo tape. They never had time. Two weeks later, Faber came by. He was in Nacogdoches, and he went into Mr. Johnson's music store. He asked if there were any local songwriters he should know about, and the Johnsons told him about me. "Fabor called me, and said I should meet him at the local drugstore. I recognized him by his sharp perforated shoes and silk shirt. We went back to my house, and I played him 'Mexican Joe.' He said he had a singer by the name of Jim Reeves. Customer evaluation for "Mexican Joe In The Caribbean (4-CD Box Set)"